The following article was written in "Saving Our Valley", a book published in 1999 by the Upper Unadilla Valley Association. "It"s not a matter of whether or not there will be a power line through this valley...it's simply a matter of where." In November 1992, New York State Electric & Gas (NYSEG), a billion-dollar public utility company, asked the New York State Public Service Commission (PSC) for permission to build a 115 kilovolt (kV) power line from Richfield Springs through the Unadilla Valley to Waterville. The line would traverse 28 miles of scenic property---woods, streams and open fields---and would cost electric ratepayers $32 million. NYSEG argued that the line, along with a new 345/115 kV substation to be constructed in the town of Exeter, was needed because the existing 46 kV electric system in that area was inadequate during certain forced outage or maintenance conditions and, as a result, did not meet the New York Power Pool's contingency planning criterion. The company said the new line would increase the reliability of its power grid in the area and allow for increased demand in the 21st Century. During the next five years, members of the Upper Unadilla Valley Association (UUVA) learned a great deal about the power of political activism---that you actually can fight city hall or even larger entities. Members and residents concerned about the impact the powerline would have on the area attended informational meetings, then went on to lobby local and state politicians, gather evidence for their arguments against the line and attend PSC public hearings on the proposal. To persuade the PSC to deny NYSEG's application, they testified in person and submitted legal briefs arguing that the power line was not needed, would damage the surrounding environment, diminish the aesthetics of the countryside, ruin farmland, reduce property values, and pose a potential health threat because of electro-magnetic fields. The power line would detract from the feature that made living in the country so attractive: undisturbed land, UUVA board member Alice Hiteman told The Observer-Dispatch newspaper in Utica in October 1994. "A person's land is sacred to them and, when invaded, their quality of life can be ruined," she said. In all, five days of public statement hearings and 12 days of evidentiary hearings were held before PSC Administrative Law Judge Joel Yohalem. One public hearing, held in January 1993 in the Mount Markham High School auditorium, drew more than 450 concerned citizens, including more than 100 who asked to speak. Although the 41/2-hour hearing could not accommodate all who wished to speak, among those who did were Unadilla Forks resident Dale Gates, then UUVA president, and UUVA member Pablo Davis, of Leonardsville. "We are not environmental zealots," said Mr. Gates. "We have already accepted many utility rights-of-way in this area, but there comes a time when we have to draw the line. I wish we could support this proposal, but we feel betrayed by this company." Mr. Davis said that after careful study of the proposal, he had concluded that the line's only purpose would be to allow NYSEG to connect with the New York Power Authority¹s Marcy-South transmission line, which runs north to the Canadian border, so that the company could sell its power to other utilities. An aide from state Sen. James Seward's office also spoke, saying the senator had heard about the project from many of his constituents and would monitor the PSC review process to ensure that their concerns would not be brushed aside but would be dealt with to the satisfaction of those directly affected by the power line. The UUVA also retained help from two key technical experts, including Robert Elliott, a well-known lawyer and lobbyist from Washington, D.C., and Richard Wakefield, an engineering consultant from nationally known CSA in Fairfax, Va. UUVA members felt the consultants' expertise and clout would help give the association a better chance at fighting the proposal from NYSEG, which already had many resources upon which to draw. "We'll need to raise thousands of dollars, probably tens of thous-ands of dollars, before we're done, but we're going to do it," James Andela, of Richfield Springs, told The Daily Star in Oneonta in February 1993. "If this line is built, it will consume about 500 acres in rights-of-way; so if we have to raise $50,000 to stop it, that's only $100 an acre---not a bad investment in your own community." The newspaper also quoted Mr. Elliott as saying that public support of the fight against the line was vital. He said his game plan would include looking closely at the need for the project or at other options that might better serve the area. Later that spring, the UUVA joined forces with Prudent Residents Opposed to Electric Cable Transmissions (PROTECT), an organization with more than a decade of experience in dealing with energy issues at an international level. UUVA-PROTECT then formed two subcommittees: one to raise money for legal expenses and the other to research its case against the line. In the years that followed, Mr. Elliott and Mr. Wakefield became better acquainted with the Upper Unadilla Valley as they worked closely with UUVA-PROTECT to build their case. Mr. Elliott sometimes even flew his own airplane here, landing---Indiana Jones style---on local rural airstrips. In November 1993, three state legislators representing the area wrote to James A. Carrigg, NYSEG's CEO, asking him to reexamine the company's plans to build the power line and delay any final decision until other alternatives had been closely reviewed. Those legislators were Assembly Minority Leader Clarence Rappleyea, R-Norwich; Sen. James Seward, R-Milford; and Assemblyman Anthony Casale, R-Mohawk, the latter saying a PSC representative also had suggested that NYSEG revisit the issue of better alternatives. In February 1994, Judge Yohalem suspended NYSEG's case and directed the utility to study an alternate proposal to run the line through Burlington and Edmeston, rather than Exeter and Richfield Springs. The decision represented a small victory for the UUVA, particularly because that alternative had been suggested by its engineering expert, Mr. Wakefield, and represented the first time a citizens group successfully had proved during a PSC case that a proposal might be electrically inferior to other alternatives, according to a report in The Daily Star. The ruling also gave line opponents time to determine whether a wood-burning plant would be a feasible power alternative. However, the judge later ruled that alternative energy sources no longer would be considered in the ongoing study of the proposed line. This angered UUVA representatives and area residents, who responded by formally appealing the judge's decision. The three state legislators who earlier had written to NYSEG¹s CEO then wrote to PSC Chairman Peter A. Bradford urging the commission to overturn the ruling. "We have high hopes that the commission will reverse the judge's decision," said Jerry Davis, who had become the UUVA's new president during the power line battle. "It doesn¹t seem right that he allowed NYSEG to alter their line so drastically, but he won¹t let any of the new solutions come in." 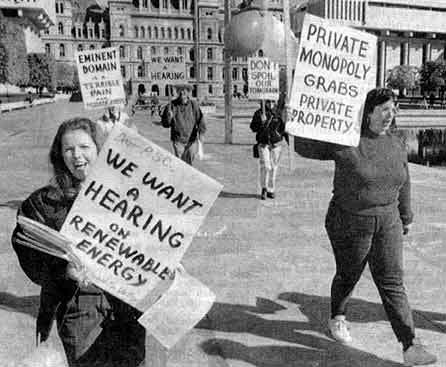 In October 1994, members of UUVA-PROTECT held a public demonstration in Albany's Empire Plaza, the heart of the state capitol, calling for the PSC to "start paying attention to the average citizen" and overturn Judge Yohalem's decision, according to an Oct. 17 report in The Daily Star. After 30 minutes of picketing outdoors, PSC head lawyer, William J. Cowan, who was responsible for all appeals, and two other officials invited the group into a conference room to discuss the issue. In January 1995, the PSC decided to back UUVA-PROTECT's appeals and bring energy alternatives back into consideration. "We are concerned about the public"s perception of our process, and consideration of the proposed alternatives...will not unreasonably delay the proceeding, will enhance public participation and will allow a full record to be developed on alternatives that may have some promise, notwithstanding the deficiency in the showings made by the parties," said PSC Chairman Harold A. Jerry, Jr. In May 1995, about a dozen UUVA members demonstrated at NYSEG's annual stockholders meeting, attended by about 600 shareholders, in Binghamton, N.Y.
"This is our appeal to the stockholders," said Mr. Davis in a May 10 article in The Observer-Dispatch. "We're hoping the stockholders are tired of the policies of (NYSEG) management to continue this." He said the company should be concerned about stockholders, since it will spend more money for studies and legal fees to fight for its proposed power line, which Mr. Davis estimated already had cost NYSEG $2 million. He told the West Winfield Star that the PROTECT group was met by two New York State troopers and a beefed-up security staff. "We had three ladies in their 70s and two kids. We must have looked pretty intimidating," he joked. "NYSEG's contention that the economic analyses presented by Dr. Berry should be ignored because no such analyses have ever before been presented or relied upon in an Article VII proceeding is not persuasive.... Moreover, the statute plainly contemplates that 'electric system economy' is among the factors to be considered by the commission in determining whether to license a proposed facility, and if this factor has heretofore been ignored or downplayed in Article VII cases, the price of electric utility service in New York State is now sufficiently high to warrant a change in the way the commission operates." Cost/benefit analysis aside, a turning point---as evidenced in the administrative law judge's preliminary decision---took place during his first-hand tour of the valley on boat and bus, over hill and field. The beauty of the valley made such a lasting impression on him that his recommended decision precluded any potential line from passing through certain areas. He said that if the PSC found a need to reinforce NYSEG's grid in the area, it should authorize NYSEG to build a transmission line only along the "Modified Alternate 3 route" proposed by the PSC staff. One advantage of that route, he noted, was that it circumvented Alice Hiteman¹s farm on Route 8, several miles south of Bridgewater. He described the farm as a "very picturesque property, the beauty of which would be seriously impaired if a line were to be constructed on the prime route. I cannot recall a more dramatic adverse visual impact on any other property along any of the proposed routes." Finally, in May 1997, the association achieved a legal and political milestone: the PSC, for the first time in its history, agreed with valley residents' arguments by using cost/benefit criteria in evaluating the need for the line, said Paul Agresta, a PSC lawyer involved with the case. Not only was the case a first in terms of the PSC using cost/benefit criteria to assess the need for a power line, but it also marked the first time a grassroots citizens' group had ever defeated this type of power line application. "People have challenged cases based on electric need before, but not on a cost/benefit basis. With most power lines, the need is usually clear. Most have been built to service a new power plant, or some upgrades have been made where electric needs were much more clear than in this case," he explained. "There have been grassroots groups that have been successful in altering a project or moving the location of a line, and some utilities have withdrawn their applications. But this is the only project that's ever been outright turned down by the commission." "All members of the Upper Unadilla Valley Association are pleased," Mr. Davis told The West Winfield Star in May 1997. "It is good to see that individuals do have the power to make changes." While denying NYSEG's application for the project, the PSC also directed the utility to further evaluate other means of meeting its future electrical obligations in the area and to report back to the commission within 18 months (by November 1998). Mr. Agresta said NYSEG responded by submitting a study which found that the company could compensate for forced outage or maintenance conditions by implementing an energy conservation alternative program. The company also noted it did not intend to submit further information about its 115 kV line proposal, given the PSC¹s opinion concerning the economics of it. "It's over. The PSC hasn't officially closed the case, but there will be an official order at some point. It's just a technicality," Mr. Agresta said in June 1999. Cynthia Andela, a spokeswoman for UUVA-PROTECT, today views the power line battle as an historic event. She said she remains impressed that a small, ordinary group of people could prevent such a large project that had significant momentum behind it, especially when that group started with such a small amount of resources. "We were blessed with a competant lawyer who had a heart for the people, not just for his pocketbook," she said. Moreover, common sense prevailed through the complicated, technical issues of the case, she said, because the cost-benefit issue raised by citizens and PSC staff ultimately provided the basis for the judge's decision to reject the proposal. She added that the UUVA was a critical element in residents' success, because the core organization helped pull them together. In all, the UUVA incurred nearly $50,000 in legal and engineering consulting debts, despite considerable donations of time and work by both Mr. Elliott and Mr. Wakefield. The association has spent years paying for their services through endless bake sales, flower sales, auctions, raffles, an art show and donations. Thanks to the generosity of area residents who have responded to these fund-raising activities, the UUVA's legal debt has been reduced to $4,000 as of July 1999. The association's fund-raising efforts will continue until the last penny has been paid. The UUVA thanks its members, consultants and all others who helped it succeed in preventing unwanted changes to the scenic landscape of the Upper Unadilla Valley. Once again, the entire valley has been spared. "In the circumstances presented...the costs of the proposed line far exceed the associated benefits and we are, therefore, unwilling to issue a certificate at this time." As a foot note, the organization did pay off the last of the debt in the year 2000 and held a dinner for those who spent so much time and energy in this cause the following year. Alice Hiteman's property (above) would have been dramatically affected by the powerline, which would have run past her pond, at left; her garden and house; and across her fields to the right. Ironically, this is the same family who did so much toward saving the valley from being flooded by the dam proposed by the Army Corps of Engineers.